On the 8th of Feb this year Occupy Oil held it’s first day of mass action. Shell Stations across the UK and indeed further afield were blockaded or picketed. 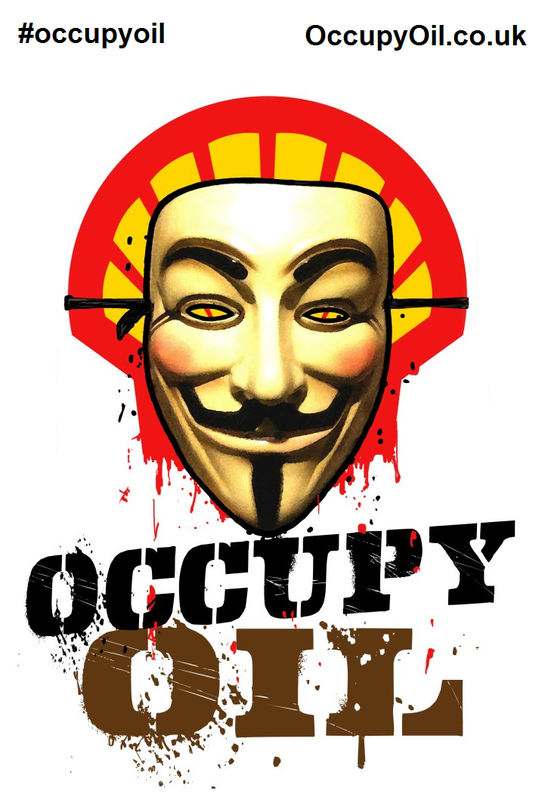 We are back and on the 22nd of May 2012 we are holding Occupy Oil the Sequel, Shell Oil will be holding their AGM in The Hague with an audio-visual link to a satellite meeting place in London. We are calling on all occupiers, groups and individuals to come together and send a clear message to Shell Oil. It’s time to make a stand. On 22nd of MAY 2012 we will Occupy Petrol Stations across the GLOBE. We call on activists to organise yourselves into affinity groups and join this action world-wide. Make banners, get sound systems and pick targets. As the date approaches we can co-ordinate actions for maximum impact. Let’s send another shot in our war against the global elites. As part of today’s #occupyoil actions, a small group of protestors braved the freezing temperatures and held up #occupyoil logos outside the nigerian high commission in northumberland avenue. they leafletted passers-by and protested for about an hour. The action followed on from this morning’s blockade at the main belgravia shell petrol station and is part of a national day of action against shell that saw garage closures in petersborough and liverpool. there may be further actions before the day is out, so follow the occupyoil hashtag for breaking news. with the bitterly cold conditions (for unaccustomed londoners at least), the turn-out was poor, and the protest (originally planned as a noise demo) was quite low-key. however, the anonymous-shell logo attracted interest and leaflets were handed out to passers-by and to visitors to the commission highlighting some of the issues of concern to activists. These include shell’s corrupt association with the nigerian government, and their continued destruction of the niger delta. it seems that nothing much has progressed since the murder of ken saro-wiwa and eight other delta activists 25 years ago, as amnesty international recently highlighted brutal police attacks on niger delta human rights activists. By protesting at the commission today, activists added to the pressure on shell, and contributed to the variety of actions. the ‘we are everywhere’ anonymous logo is particularly resonant and reminds shell that disruption can occur at any time in protest at their rotten record in human rights, environmentalism, and climate change. Two constables were posted at the door to the commission, and a nearby van full of police kept watch, joined briefly by forward intelligence officers. In the third london action today, the upper street shell garage in islington was closed by activists for over an hour. while a samba band played, loads of leaflets were handed out. many passing motorists hooted support and cyclists often cheered. this was the third london action under the #occupyoil banner today, following on from this morning’s blockade of a garage in belgravia, and a small protest outside the nigerian high commission at midday. As per a recent action, police seemed to have gained intelligence about this site, or maybe made a good guess (as it has been the target of previous actions for many years). either way, they were clearly not sure of the time, and perhaps jittery about the possible scale of the “occupyoil” movement (which claimed to be about to close down every garage in london), they stationed a police van nearby from 10.30 this morning. The van was still there this evening, and activists gathered in a pub several hundred yards away near highbury and islington station. again, either through covert surveillance or a lucky guess, the police arrived outside the pub, with a vanload parked up outside, as well as two FIT team cars buzzing around nearby. So the activists, around 20 people, set off on a little walkabout, and as they went the wrong way down a one way street, FIT officers followed on foot while the van drove round. however, despite a circuitous route, the activists couldn’t shake off the surveillance (hard for a large group of people carrying banners and drums). so, finally emerging from a side road opposite the petrol station, they were greeted by a row of officers across the front of the garage. sergeant “driver” (no conflict of interest there) informed the protestors that they would be arrested for ‘aggravated trespass’ should they attempt to blockade the forecourt, but that they could continue their protest on the pavement outside. But soon after the samba band had started up and the banners were unfurled, the station staff emerged from their shop, placed bollards across the entrance and closed the garage, stating they’d been told to do so by management, and so providing the required result for the action anyway. Comedy activist charlie veitch happened to pass by on a bus, and he dropped by with his megaphone for a few minutes adding a comic twist to the proceedings. News of the action spread quickly via the internet, and squatting activists came up from their latest city repossession/occupation to swell numbers a little. Comedian and comedy writer paul whitehouse was among the many passers-by who were handed leaflets. Due to the cold weather, a few people having to leave, and the late start to the action, the protestors decided to finish together and leave together as a group, after managing to close the garage for business for about an hour and twenty minutes in total. The police operation today raises some serious questions about their role in protecting shell. at least one van full of police was stationed in upper street for more than eight hours before the action. two FIT teams were deployed during the evening. once the action began, there were a further three vans of police parked up with engines running near the garage. So who is paying for all this? is it the public, in which case, in times of austerity and serious crime, is this a sensible use of resources? or is it shell, in which case is this another example of police being privately hired? (as per the recently broken story about virgin). Is it reasonable anyway, whoever is paying, for the police to spend so much energy protecting the commercial interests of such a dodgy company? the past and proposed actions against shell are not dangerous, never violent, and wholly legitimate. they succeed in closing single outlets for a period of a few hours at a time, and are a symbolic attack on a multi-national corporation that made a profit of more than £18 billion last year – that’s £35,000 per minute! Shell has been implicated in irish government corruption over its rossport oil pipeline and refinery. They are up to their necks in controversy over their tar sands extraction, facing an international law court case for trashing indigenous lands in canada, a project that scientists claim could in itself lead directly to several degrees of climate change. Their oil spills around the world devastate lands. new arctic drilling has already led to spills in virgin territories in canada and alaska. leaks from the sakhalin refinery in east russia threaten the breeding grounds of pacific grey whales. in the niger delta, the devastation is incredible, with oil spills equivalent in size of the BP deepwater horizon spill occuring EACH YEAR for the past few years. It is surely indefensible then that the authorities spend so much energy on pre-emptive and oppressive policing of anti-shell actions. Presumably, they will be putting on a huge security operation to avoid any disruption of the business meeting tomorrow evening in west london with special guests, the managing director of shell nigeria and the nigerian energy minister. Activists closed down the very busy belgravia shell petrol station in pimlico this morning as the first sortie in a day of actions under the umbrella of #occupyoil, and mainly targetting the oil giant ‘shell’. There will be a publicly announced noise demo for an hour at noon today outside the nigerian house on northumberland avenue (off trafalgar square), with other shell actions planned throughout the day. The pimlico garage was targetted after being identified as a particularly busy one during morning rush-hour, in a very salubrious area, and so, just ten minutes after the garage opened for business, at around 7am, activists took to the roof of the garage and hung a large anti-shell banner over the edge while legal observers kept an eye on events. The garage workers had to immediately close down the garage because of health and safety protocol, and they called the police, the first of whom arrived within twenty minutes. Over the next hour, more banners and activists arrived, until about a dozen people were involved. police have so far not acted, waiting for a specialist team to clear the roof safely. The garage, on the corner of ebury street and ebury square, has been closed for nearly three hours now, and a substantial number of porsches, landrovers, and other sloaney vehicles leafletted and turned away, so the action has been a great success for shell activists, and an excellent start to the #occupyoil day of events. There are solidarity actions taking place in liverpool and petersborough, and more london actions planned today. After three hours, the garage remains closed, with a police helicopter and two vanloads of TSG among the police visitors. During negotiations, police pleaded with the activists above to come down so as to avoid having to call in a specialist team. police however wouldn’t make any promise not to arrest in return (and such promises have anyway been broken in the past, most notably in the case of the fortnum and mason ukuncut occupation last year), and so the activists declined, locking on for additional security. The specialist police climbing team eventually arrived at around midday, and they spent nearly an hour cutting through the d-locks that activists had utilised. In all, the garage was closed for more than six hours, and there were three arrests for aggravated trespass. the arrested were taken to belgravia police station nearby. 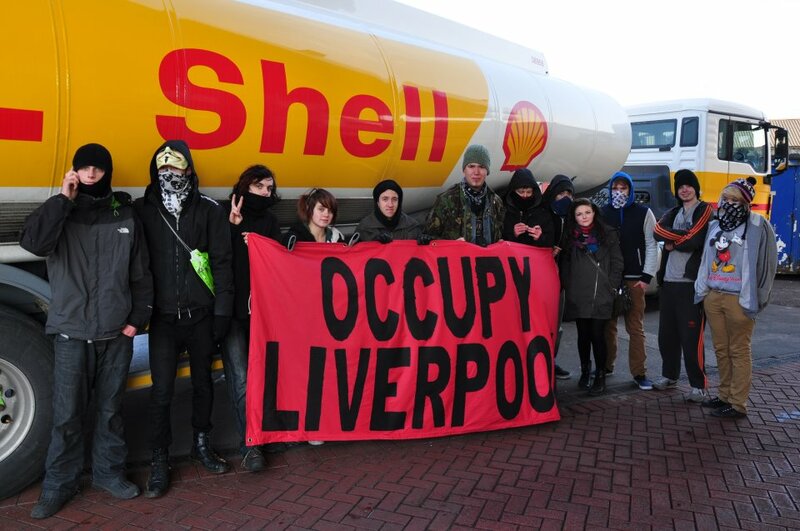 Today Occupy Liverpool took part in a global action called ‘occupyOIL’ (organised by rise up) highlighting the war for resources, especially oil. For me, I really liked the idea of occupying a petrol station, the public are already angry about the high prices of petrol, and i see oil as a way the population are manipulated, it is in the earth, therefore i fail to see how companies such as shell can claim to ‘own’ it, never mind sell it back to us. The petrol companies argue that petrol is cheaper than water, that doesn’t mean petrol is cheap, it means water (a basic human right) is too expensive, and is again naturally occuring. About 10 protesters took to occupying the Shell garage on Scotland Road, Liverpool, they managed to block the entrance and thus close the garage temporarily, with the majority of potential customers actually being fairly supportive and understanding why they were doing it. Before too long the police arrived, followed by more police, and again even more police, in the end there were more police than protesters! With threats of arrest for ‘obstructing a public highway’ the protesters moved to the pavement, and then decided to leave, agreeing that the protest had been a success.